There are two items that you will definitely find in every South Indian household – curd and milaga podi (dry chutney powder or gun powder as non-Southies call it). Podi is potent gun powder that can make any food item tasty! It is a must-have in every household as it has a good shelf life and can accompany most food items such as dosa, idli, and even rice. Lazy to grate coconut and grind a chutney? All you need to do is take few spoons of podi, mix some oil in it and serve along with the dosa or idli. You wont even miss the juicy coconut chutney! Podi is also a safe bet when you are packing food for long bus/train journeys. Every household has their own secret recipe for podi and it tastes different in every house. When in school, I used to taste podi from my friends’ lunch boxes and each of them would taste different. Podi would differ in texture, taste, and visual appeal. Grainy, powdery, spicy, orange, greenish black, they come in all varieties. Recently, I tried MTR chutney powder (they market podi by that name) and I quite liked the taste of it. Unlike authentic Tamil Nadu style podi, this one is tangy. I believe tamarind is an ingredient in that recipe. Though I liked the MTR taste, being the conservative types when it comes to food, I prefer the authentic spicy taste without any tanginess. This recipe is a mix of 2-3 different types of podis that I have had. In a heavy bottomed pan (preferably iron), dry roast the grains one after the other until the grains turn red. First roast black gram. Then roast chana dal, followed by rice. Okay, I cheated! I roasted chana dal, kept it aside and then roasted the raw rice and black gram together. That works. When the black gram and rice are half done, add red chilies, black pepper, asafoetida, and curry leaves. If you are using asafoetida powder, you can add it towards the end of the roasting exercise. Turn off the fire and then add the sesame seeds and salt. Keep aside and let it cool down a bit. While the roasted grains are still warm, dry grind them in a mixer. You can choose to make it powdery or grainy as per your preference. Store in a dry air tight jar. Will stay good for 3-4 months. Choice of oil to be mixed with podi is a personal preference. Podi is served along with sesame seed oil (til oil/ellenna/nallenna) in most parts of Tamil Nadu. No points for guessing the oil that Keralites prefer! Idlis and dosas soaked in spicy podi are a rage in restaurants these days. Whether you have a chutney and sambhar to go along with it or not, a well-made podi can up the taste quotient of even a poorly made idli/dosa. Soft, instant, healthy, and appetizing dosa. Shallots – Onion can be used but does not give the same taste. Wash and soak the raw rice for 4-5 hours. Grind the rice along with the peeled shallots and red chillies. The batter should be smooth and neither too thin nor thick. Add enough water to the batter to get a spread-able consistency. Chop methi leaves and add it to the batter. Add salt. Mix well. Heat griddle and pour about a full ladle of batter on to the griddle. Spread the batter around carefully using the bottom of the ladle. Maintain low fire while spreading the dosa. Close the dosa with a lid. The fire should be on medium. Remove the lid after about 40 seconds to a minute. Pour 1/2 tsp oil around the dosa and flip it over. The dosa does not need to be closed with the lid now. Let it cook for about 30 seconds. This tasty dosa can be had on its own. The spicier tongue can have sambhar or chutney along with it. This is a very healthy diet and saves the hassle of making sambhar or grinding chutney. Tastes great even when cold. Shallots and methi leaves add to the unique flavor of this dosa and make it nutritious. 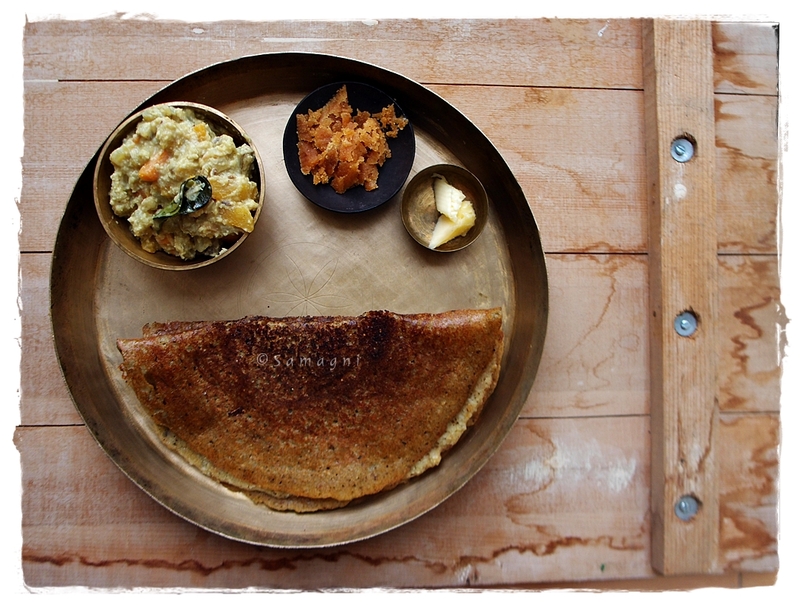 Spreading this dosa on the griddle can be a little tricky and needs some expertise. This recipe is a family specialty. The traditional choice for methi leaves is drumstick leaves. Since they are not available where I live, I use methi leaves. This dosa needs a medium level expertise in dosa making. It can be slightly tricky for a beginner to spread this batter. Since only raw rice is used, the batter tends to stick to the griddle if the fire is too high. The key is to maintain low fire while spreading the batter.